• Bloody red shrimp are now in all of the Great Lakes. 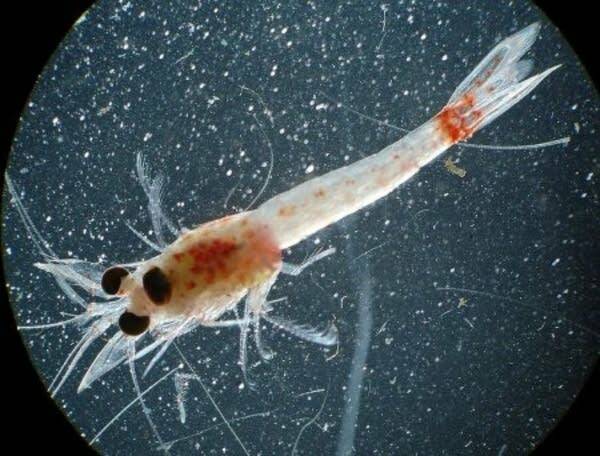 • The shrimp can degrade habitat and compete with native species for food. • Monitoring continues but it doesn't appear the shrimp are spreading in Lake Superior. A new invasive species has made its way into Lake Superior: the bloody red shrimp. U.S. Fish and Wildlife Service officials announced this week they found a single specimen of the shrimp in the Lower St. Louis River in a bay shortly across the Wisconsin border from Duluth. The shrimp are tiny — usually under a half inch long — but they can wreak havoc on an ecosystem. "The species, like other invasive species, are known to reproduce and spread, ultimately degrading habitat, out-competing native species and short-circuiting food webs," a statement from the Fish and Wildlife Service said. Bloody red shrimp were first found in lakes Ontario and Michigan in 2006, according to the Fish and Wildlife Service. They're now documented in all the Great Lakes. The species eats waterfleas and algae. They can become food for bigger fish, and competition for smaller ones, according to the University of Wisconsin's Sea Grant Institute. They're native to Eastern Europe and have also spread as invasive species across that continent, according to the Sea Grant Institute. The shrimp live about nine months and reach adulthood in a month and a half. It's likely the bloody red shrimp wound up in Lake Superior via a ship discharging its ballast water that was taken from another source, said Jeremy Bates, an aquatic invasive species specialist with the Wisconsin Department of Natural Resources. Ships take on ballast water from one area to help with stability and balance, then they dump it in another place when they don't need it. That water can contain invasive species, too, and this practice has been blamed for the spread of nonnative species across the Great Lakes. There are no indications so far that bloody red shrimp are widespread in Lake Superior. And they don't reproduce at the rate of zebra mussels or other prolific species, Bates said. "They do form swarms and can look intimidating. But since there's only been one found we don't know whether or not it's really a widespread introduction or if this is just something where one happened to get up here," he said. "It's not established yet in the area." It's too early to tell how the shrimp might act in Lake Superior's waters, he said. Bates said the Wisconsin DNR isn't planning any increased monitoring for invasive shrimp in Lake Superior, but it will consult with other lake stakeholders to see if there need to be changes in monitoring or research practices. The federal Fish and Wildlife Service says it will continue "targeted sampling" for bloody red shrimp and other invasives in the Great Lakes as part of its early detection program.